- The main character has a flaw and must overcome it. - The main character wants something and must work to achieve it. Dissect books down to their basic structure, and you'll see the similarities. Your job is to put special touches on these story frameworks to make them uniquely yours. Here are some favorites that aren't new stories - just different perspectives! Dow is giving away a copy of her book, Maya Lin: Artist-Architect of Light and Lines or Mela and the Elephant upon its release in mid-April! To be eligible for prizes throughout the challenge, you must comment on each post, be registered, and consistently read picture books throughout the challenge. Dow Phumiruk loves creating children’s book art and stories. 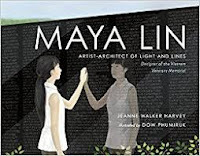 Her big break came after signing with East West Literary Agency: soon after, she received an offer to illustrate Maya Lin: Artist-Architect of Light and Lines (by Jeanne Walker Harvey, from Christy Ottaviano Books). This book was a Junior Library Guild Selection, an Amazon Best Book of 2017, and has received a Horn Book starred review. Look for her upcoming projects: Mela and the Elephant, Counting on Katherine, and Mouse's Christmas Gift this year. 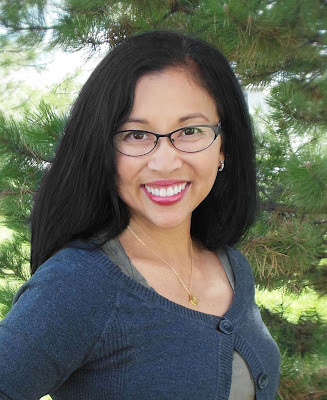 Dow has been a member of SCBWI since 2011 and of ReFoReMo since its beginnings in 2015. She lives in Lone Tree, Colorado with her husband, daughters, and an assortment of small pets (most notably a dwarf rabbit named Lottie and a cute bearded dragon named Sparkles). Thank you, Dow, for simplifying the basic themes of many picture books. It's fascinating how many fall into these two themes! As you say, the trick is finding a fresh way to develop them. Great mentor texts! Thanks for the mentor PB suggestions on theme! There are no new story structures, just new ways to put them to work. Thanks for your list of mentor texts! I have to remind myself to not feel discouraged when I find a book with a storyline that’s been rattling around in my brain. Someone got to it before I did! I do learn from them. Thanks for these titles and the reminder that it is the special spin we each put on a theme that makes life interesting. Thanks for the reminder, Dow! I'll keep looking for that new perspective! I love the advice of adding special touches to universal themes. That's something I will remember. By dissecting the books to the common structure, then comparing those books, we sharpen the focus on what are special touches that make each book unique. Thanks for a great list. Thank you, Dow, for breaking things down so succinctly! And congrats on the release of your new book. Thank you for this list, Dow. I have the first two books. I look forward to diving into themes. Universal themes with my own unique take and style...it really is all about what each writer can add to what's already out there. Thanks for the list. As authors we get to bring our perspective to those common themes through our work. Bagel in Love had my grandkids up dancing. Who would have thought! Thanks for the reminder about time-tested strategies of success in picture books, Dow! There's power in the common themes and the similar and yet still distinct approaches to each individual story. Many thanks for sharing! Thank you for the important reminder about the power of universal themes. Love Roscoe vs.the Baby. TY, Dow, for sharing the texts and reminding us that putting our own spin on a common theme is crucial. Looking forward to Mela! Yes, Dow, it is a good reminder to distill books down to their essence. I am always surprised at how many ways there are to tell a story based on a universal theme. Thanks, also, for the extra book titles. I will be sure to check them out. Thanks for sharing! I just read Be Kind. This concept PB is well structured and makes a great mentor text. 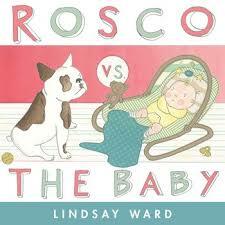 I need to read Roscoe vs.the Baby. I loved your Maya Lin book--one of my favorite pb biographies of recent years! Always a good reminder to put your own spin on a theme. I loved A Morning with Grandpa and his incredible patience as she bounced around. 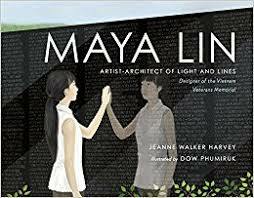 Thanks for your post Dow and I can't wait to read your own book about Maya Lin! Great point. We need to find our own unique perspective to share. Thank you! Your selection of books was great for finding new authors, takes on multi-cultural subjects and comparing ideas. Thanks for the new choices to read. Thank you, Dow. I have also found that there is only a small number of basic themes, but so many wonderful books based on each one. That's part of the fun of creating books. That question of "What does the main character want?" is so often a discussion in dissecting middle grade books — it is refreshing to see that same theme applied here for picture books. Thanks! Such a great variety of common themed books with different hooks! Thanks for sharing, Dow. Great list of books where the author has put their unique spin on a universal theme. Thank you for this post! Wonderful book choices! Thanks, Dow! Glad to get this list of books. Thank you. Dow, you picked delightful mentor texts for your post which is succinct and thoughtful. Thank you for the texts as I have not read a few of them and now I have! This post came at a perfect time. I'm struggling with how to proceed with an idea of a story and this helped greatly. Wow- I haven't read ANY of these yet- put them on hold and excited to read them. Yes, it's amazing how many renditions of common themes there are, as well as books on a particular topic. Very heartening when you set out to write a story and feel like it's already been done. Yes, it's probably already been done, but has it been done *YOUR* way? Thanks for your insight regarding use of themes and your book suggestions, Dow! I'm a huge fan of the Maya Lin biography. I'm excited to check out your forthcoming books. Thank you this great diverse list! Fabulous list! Thanks so much! Thanks for your list of mentor texts. I LOVE your book, Maya Lin!!! Thank you for sharing your thoughts and these great mentor texts! Thanks for sharing these titles that all have their own unique spin! I enjoyed Maya Lin and look forward to your upcoming books. Thank you for your thoughts on common themes and great mentor texts. Sorry my library doesn't have Bagel in Love. I'm definitely going to have to track it down another way as the title is most intriguing! Thanks for all of the suggested titles. These are wonderful books - and thanks for the very simplified outline of themes. This is such a helpful post! Thank you for boiling down the most common themes and reminding us that it’s our job to make them uniquely ours. Great article Dow! It is interesting to look at how many stories share the same underlying structure and yet have their own unique charms. Thank you for reminding us to take simple themes and making them our own. A great list! Putting your own twist on things is the key. Thanks, Dow. Thank you for this insightful post - and a great list of books to explore and learn from. Thank you for the reminder to distill books down to their essence. It's amazing how many books have the same simple theme, told in so many different ways! Thank you for the great mentor texts. I've read some and will try to get the others. Thank you for sharing your selection of books and your inspiring post! Thanks for the mentor text suggestions! Thanks for sharing about common themes. Now I will have to look for those two as I read. Thanks for the book list! Loved Roscoe versus the Baby! I just got Bagel in Love out of the library, so I'm excited to read that next. I read some of the ones on this list, and I'm looking forward to reading the rest of them. Thanks! It is interesting to see new takes on old themes. I particularly like NO KIMCHI FOR ME! I must try the recipe included! Thank you, I look forward to reading all of these!!! Always searching for new perspectives. Thanks for some great mentor texts! Universal themes aren’t always immediately obvious. Nice collection with a variety of hooks! Thank you, Dow, for these great titles to explore as mentor texts. Most of these are new to me. Thanks for sharing, Dow! When it comes to themes, mentor texts are so helpful! Thank you for your list, Dow! Thanks for your insight on how to recognize similar structures in books! I read "Kind" & I look forward to reading your other suggestions. Thank you for sharing your list of books with common themes. I liked when you said that we have to find ways to put our own touches on common themes to make them uniquely ours. Thank you. It's amazing how many variances there are on the same basic story framework. Thank you Dow for these great mentor texts! Thank you, Dow! Nice to see a few CO authors here! Figuring out what my main character wants has always been a struggle for me. These book picks provide great models, as each protagonist has a clear want which is established right away, whether it is Rosco the dog wanting to maintain his title as king of the castle, Mira wanting to fill her world with color, or Bagel wanting to find a dance partner. 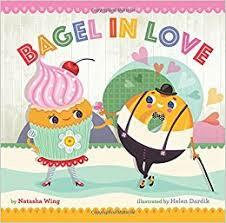 I especially loved the clever puns in BAGEL IN LOVE, by the way! Knowing what the Character wants and then being able to have the reader WANT to have the Character get it - that's the key to total engagement! Great list of books! Thank you. Making sure the main character solves his/her own problem or figures out "how to get what s/he wants" is something that I'm struggling with right now so your post and mentor texts were timely for me. Thank you! Thanks for this great list, Dow, and your smart suggestion to dissect PBs to discover their underlying themes. I look forward to reading your books. 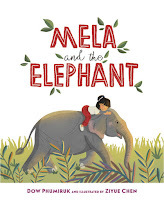 Congrats on MELA AND THE ELEPHANT! Dow, thank you for the great lists of examples. Congratulations on your upcoming publications. Struggling with getting the MC to solve his/her own problem in a child friendly way is tough. I have heard it said that there are no new stories - just fresh perspectives on them. Thanks for reinforcing the idea. Great list of mentor texts to show new ways of looking at things. I especially enjoyed Roscoe vs the Baby and Gaston. Goodbye Summer Hello Autumn was also cleverly done. I look forward to reading books with common themes and being aware of this. Thank you for the list and most especially, thank you for providing the copyright dates. It does give a great feel for what is current. So many to check out. Thanks! How true about from a basic structure we can add our own "special touches" to make a PB with a common theme totally fresh and unique. Thanks, Dow! Yes, from the outside it looks so simple, just two basic frameworks. But, the devil's in the details! I am waiting for Maya Lin at my library. Can't wait! Thanks for this post, Dow. I loved MAYA LIN. Congrats on your latest book! I look forward to reading it. Hi Dow, thanks for this post. I'm taking a pb illustration class that suggests we do this very thing. Your article confirms it. Can't wait to dissect a few and then compare them to the book I'm currently working on. These are all great. Can someone help me with Goodbye Summer, Hello Autumn. I love it, but what does the MC want (I struggle with this sometimes)? Is it as simple as him wanting to say goodbye to summer and welcome Autumn? Am I trying to overthink it? I chose this one mostly because it is so simple in writing, yet successful in many ways. I thought of the challenge in another way: as characters approaching change. The main characters accept the "loss" of autumn and eventually welcome winter. I may be guilty of reading too deeply here, too, but I think it is a great example of just how simple and timeless a story - in this case of change and seasons - can be! Hope that helps! Thank you for that additional insight! I agree it is so simple and elegant, and I love your focus on the writing! Thank you! That is a great way of looking at it. I love how simple the text is, but yet it is able to convey a lot of meaning. Thank you, Dow, for simplifying the basic themes. Useful! Thanks for this list, Dow. Rosco VS the Baby was so much fun! Gaston is a favorite of mine. Most of the others I still need to read. Thanks for sharing these suggestions with us. Thank you, Dow. I must get studying. Thank you for giving us these lenses through which to consider PB texts. It was a wonderful guided tour. Your focus on theme drove the point home that we are not reinventing the wheel, but we are bringing our own unique perspectives to these ideas. Thanks for the great list to study. Dow, thanks for highlighting these books with common themes, and wishing you continued #kidlit successes! It was interesting to break these books down to the find the simple underlying theme. Other themes are layered on top of these two common themes so it was great to think about it in this way. Thank you for the helpful perspective on honing in on the common themes. Great mentor text list! Cool. I'm looking forward to exploring these titles and comparing/contrasting them! Thanks, Dow. A fun and useful exercise, and a great list of books. Thanks for the post! Such fun examples of different voice and writing flourishes that can bring stories alive. I've been so busy trying to figure out plots and stories that sometimes I think the actual writing is getting lost! DOW: THANK YOU for the GREAT suggestion and insight into breaking down each story to their basic theme and framework. I am especially excited to try this with the book examples you provided, many of which I haven't read before--ALWAYS A THRILL!!! THANK YOU for the inspiration! Dow, thank you for helping me to discover new mentor texts which portray common themes in unique ways. I appreciate you answering Rebecca Herzog’s question as I had a similar question after reading Goodbye Summer, Hello Autumn. Your answer helped me as I thought about how the character was approaching change, the change of seasons. Thank you, Dow. I am grateful for the fact that we all could write about the same common theme, but each story would turn out differently. I love the idea of dissecting down to the root of the story. At heart, the common themes can be explored and developed in so many different ways. It is always exciting to read how an author spins his/her unique story from an often common theme. Thank you for this great list and for breaking down these two essential themes. So true! There's never anything completely new, just common themes with a new perspective. Great examples of mentor texts! We've all heard it said that there are no new picture book "ideas"/structures- we simply have to find a way to bring a unique spin, from our own voices. So true! The uniqueness and the special touches are the fun of it, for both the readers and the creators. Isn't it a joy to see everything come together? Thanks for the list! Thank you for your list of mentor texts on these themes. Thanks for your post. I like the idea of boiling down books to their underlying theme. Most of the time, it's pretty easy to identify. Occasionally, it is not. Those books are harder to connect with. 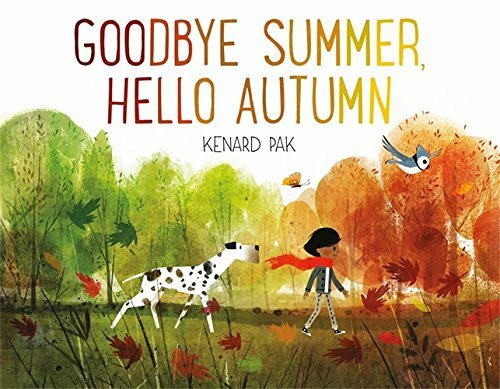 I especially enjoyed GOODBYE SUMMER, HELLO AUTUMN--Kenard Pak put a new spin on an age-old topic. These mentor texts are refreshing and inspirational. Thank you! What a great tip! Reading mentor texts in relation to each other will take my research to level. Great book list-and I love your Maya Lin book. Dow, I am looking forward to reading your Maya Lina book. The illustrations look beautiful! I always wondered how people take a common theme and make it their own. Thank you for your post. Great reminder and I love these mentor texts. Thanks! Thank you for sharing these mentor texts and exploring theme with us. Focusing on theme is major-I think this is a really useful activity to do to our current WIPS. Thanks for the great mentor text suggestions! Adding our unique perspective to universal themes is a great reminder. Some of the books on your list are new to me. I'll be studying all with eyes on underlying themes. All of these titles share a common thread. Thank you, Dow, for reminding me of some great titles from just a few years gone by. LOVED the art and characterization in No Kimchi for Me! Thank you for giving us more to consider. Being very fond of elephants, I look forward to reading your book Mela and the Elephant. Thank you so much for this post! I ended up reading some of the back up options as well and I'm still chuckling about Gaston, that book is so funny. I agree with you that a lot of texts have a very similar premise, and it's how you present it that will make it stand out or not. I liked that If Your Monster Won't Go to Bed made the kid the parent, giving her the responsibility of caring for another living thing. I suppose this would fit into the "character wants something and works hard to achieve it" category. Roscoe vs. The Baby seems like a perfect summary of someone's life with a kid and a baby (mass chaos). Both the dog and the baby have a flaw that they must overcome together. 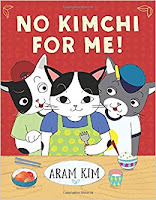 No Kimchi For Me is another character flaw book, but completely different from the others on this list. It follows the classic "three tries before success" story arc, but intertwines bits of Korean culture into its message. These are good example texts of how to reinvent storylines that have already been done. Thanks for a great post, Dow. I look forward to your upcoming books! It's an observation we've learned from the beginning, but I love the book choices you offered to help us dissect the two themes. Thank you for the suggestion to dissect books to see their basic themes. I loved the way Pat Zietlow Miller explores the challenge of being kind in Be Kind. I plan on using this book as a discussion opener with my first graders. Thank you this interesting selection. You selected beautiful stories to illustrate these two major themes. Thanks for adding these titles for us. Thanks for the extra long list. Fun reads. I haven't read any of these! Thanks for sharing. I can't wait to check them out. This point of theme makes clear the conflict. With that in mind it is easier to find the reasons in the story the reader will keep turning the page. Thank you for sharing some new books with me. I look forward to read them! Thanks for the great list and bonus list too! Thanks for showing that it's all about the special touches we put on a theme. Great mentor texts and context! Thank you! I loved your Maya Lin book so much...thanks for sharing! It's amazing to see all the fresh new twists on these basic themes. Thank you for the great post and mentor texts! These are so different from one another but still share the theme of character flaws and wants. Great examples! When I get stuck on a WIP, it's always helpful to go through and break it down to the basic theme. Thanks for these great mentor texts! 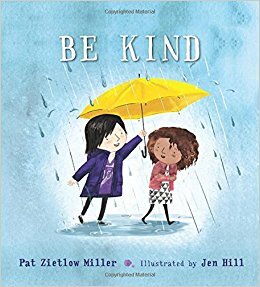 Be Kind is one of my new favorites. I'm disappointed that my library doesn't carry Rosco vs. the Baby. The pages available on line look really cute. Hi Dow. Thank you for this list and the suggestion to break down the story to discover the theme. Also, I want to congratulate you on MELA AND THE ELEPHANT, I can't wait to find this book of yours. Pulling a book down to its core is essential for making sure my books resonate. Thanks for another way to look at picture books! I agree that the two themes you mention here are essential to great storytelling. I look forward to reading these books and seeing how these themes are handled. 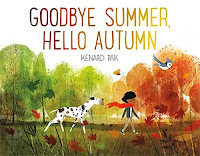 I enjoyed the back and forth between the elements in Goodbye Summer, Hello Autumn, especially the POV from the puddle :) Unlike many PBs, there was no challenge or obstacle for the MC to overcome or goal to achieve, so I liken it more to a concept book. Looking forward to reading more of these once they become available in my library! I have to agree on your assessment of the concept book on Goodbye Summer, Hello Autumn. Thank you for pointing this out! More FAB selections! I have fallen in love with Gaston! What a beautiful story with an equally beautiful message! Very interesting, thought provoking article. Thanks Dow! I've wanted to read Maya Linn biography for a long time. now I will. Yes making a theme uniquely mine is the first step to success. These are great mentor text suggestions, Dow! I need to make a trip to the library! You make it sound easy! :) Great suggestions. I wish I had time to thank all of you individually for your thoughts on my recommendations, your congratulations on my recent books, and for enjoying and learning with us through ReFoReMo overall! Good luck with your projects! Thank you for these recommendations! I've only read one. Looking forward to reading the rest. I was so excited about Bagel In Love - but haven't gotten it yet. :-( Thank-you for these selections. We all have so many big and different ideas, but it's amazing to consider them when boiled down to the basic theme. Realizing that every story has already been told can be freeing, and provide a scaffolding for voice, character and setting to spin an evergreen theme in a fresh way. Currently working on doing that very thing with the classic "friendship story" that is the crux of so many picture books. It's fun! Maybe Something Beautiful is a lovely book about the importance of art. Peter H. Reynolds with his book, Dot, gave this lovely theme a spin that made this book unique. Hi Dow! I can't wait to read Mela and the Elephant! Thank you for your insightful post. Hi Dow! It was great meeting you at the SCBWI NYC conference. Thank you for the helpful post.